It's a Max Fun Drive miracle! 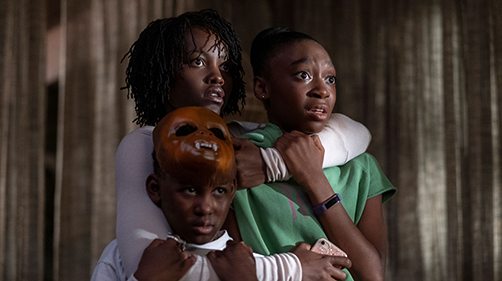 An episode released on a Thursday, Ricky's back at the helm, AND the gang's talking about one of the most hyped movies of the year - Us. There are gonna be SOME spoilers in this episode, but remember what April says "It's not what happens but how it happens that makes a movie worth watching." The crew also discusses their favorite big, dumb action films. And as always, staff picks. In news, R.I.P. Larry Cohen, Disney gets rid of the Fox 2000 division, and a high school in New Jersey puts on a theatrical production of Alien. Every year in college, my favorite event was the UCSC Print Sale. The whole studio art department at UCSC sells prints for absurdly low prices for one long weekend. My house is still full of things I bought at the print sale, and if I were in the Bay Area, I'd be planning to drive down right now. If you're in Silicon Valley, it's a great excuse to get over the hill and spend a great day in the Scruz, and if you're already in the Monterey Bay Area, you should just go. It's great. Walter Mosley is the author of more than 30 books in a broad variety of genres, but he's best known for his detective fiction. His Easy Rawlins series began with 1989's best-selling Devil in a Blue Dress. His latest series features a new hero, the pugnacious, middle-aged Leonid McGill. He just released the second novel featuring McGill, Known to Evil. Before he was a novelist, Mosley was a computer programmer. Originally born in Los Angeles, Mosley spent time in the Bay Area before moving to New York City, where the McGill novels are set. I'm off to Santa Cruz for Maximum Funny! I'm headed to Santa Cruz -- Saturday night is the big show! I'll be hosting a performance by Mary Van Note, Brent Weinbach and Kasper Hauser at the Kuumbwa Jazz Center in Santa Cruz. We're calling it "Maximum Funny," and all the proceeds from the show will benefit KUSP, the station that carries TSOYA in the Scruz. Check out Wallace Baine's really nice piece in the Santa Cruz Sentinel for some more info about the show... or check out Traci Hukill's great piece in the Metro Santa Cruz. This thing's gonna be a blast, and the money goes to a great cause. Get your tickets at KUSP.org. This week on the program: UC Santa Cruz professor Bruce Bridgeman and Curb Your Enthusiasm Executive Producer Robert Weide. Bruce Bridgeman (left) talks with us about his unusual area of research: world-famous Santa Cruz tourist attraction The Mystery Spot. Robert Weide started his television career as a comedy documentarian, but his relationship with Larry David eventually led him behind the camera for David's series "Curb Your Enthusiasm." Weide served as Executive Producer of the series, and directed many episodes. 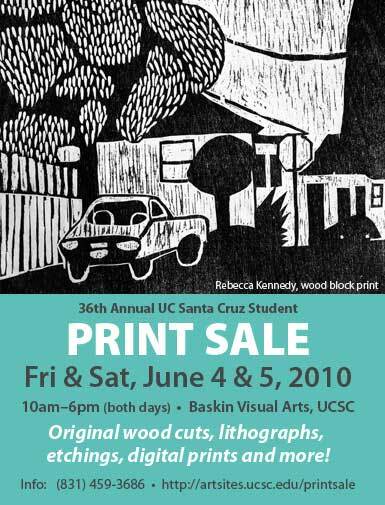 One of my favorite annual events in Santa Cruz is the UCSC Print Sale, which is coming up this weekend. Whether you live in the Monterey bay area, the south bay, or San Francisco, it's worth a trip. 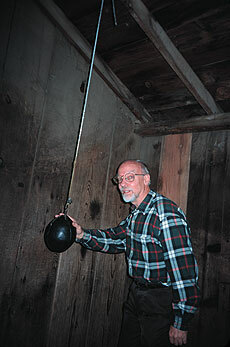 Once a year, the art department at UCSC throws open their doors to sell student art. Some of it isn't to my taste, but every time I go, I come home with a few beautiful pieces. There are prints on paper, prints on fabric, block prints, lithographs, t-shirts, cards and a million other things. And the most expensive pieces are only thirty or forty dollars. From where I'm sitting now, I can see three pieces that I bought at the print sale, and there are a few more in my closet (on clothes, of course). It's a wonderful event, and not to be missed. I reccomend driving down from the Bay Area for a morning at the print sale and an afternoon at the boardwalk or out on the beach. You won't regret it. Below is Hopeful by Kristal Passy; above is Epic by LeeAnn Jacobs.